Introducing All-In-One Hand Washing System! 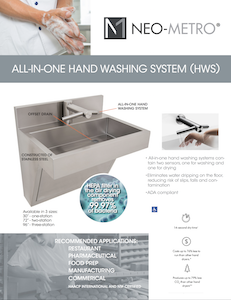 Introducing the Neo-Metro® All-In-One Hand Washing System! Ideal for restaurants and food processing, preparation and service, the All-In-One Hand Washing System features an angled, durable stainless steel constructed basin with an offset drain to minimize splash. In addition, the system includes the Dyson® Airblade™ Wash + Dry, a revolutionary faucet that allows users to wash and dry hands right at the sink, eliminating water dripping on the floor and reducing the risk of slips, falls and contamination. A HEPA filter in the air drying component of the faucet removes 99.97% of bacteria. The All-In-One Hand Washing System is ADA compliant and is available in three configurations: 30” one-station, 72” two-station and 96” three-station models. In addition to food service, the All-In-One Hand Washing System is also recommended for pharmaceutical, manufacturing and commercial applications. Learn more about the All-In-One Hand Washing System by downloading the flyer today!